GreenWorks provided site design for the new Health and Wellness Building and surrounding open space on the Lane Community College campus in Eugene, Oregon. The team was tasked with creating a dramatic, attractive and sustainable environment for the new academic building’s site. The resulting design demonstrates responsible environmental practices and creates an active “living” classroom for educational opportunities. Rainwater is captured and conveyed into bioswales, translating health and wellness to the physical landscape. The Health and Wellness Facility is located at a major entrance point to campus, making clear circulation and a sense of arrival essential to the design concept. The design connects the multiple levels and pathways surrounding the Health and Wellness Center to the rest of the campus, creating a clear entry sequence that maintains accessibility for all. The result is activated exterior spaces that engage and connect. GreenWorks, in collaboration with SRG Architecture, was hired by the City of Tigard to site the city’s new library and community center on one of the most pristine and pastoral pieces of property remaining in the tri-county area. The property is wedged between an existing state highway, which will be widened in coordination with this project, and a virtually untouched segment of Fanno Creek. 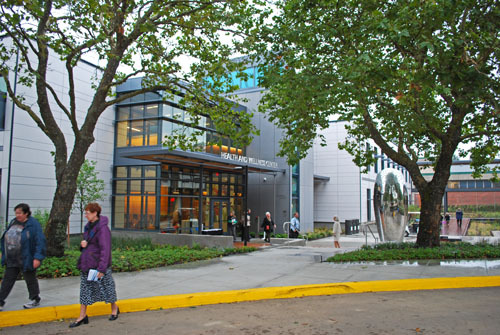 As part of the overall site design, we were responsible for siting the building, parking, adjacent plazas, and stormwater facilities in such a manner as to protect the existing landscape forms and several significant trees. We were challenged with integrating the significant site characteristics and the proposed buildings and support facilities together into a cohesive, sustainable, and attractive development. Sustainability issues included: preservation of existing landforms/ enhancement of views, preservation of existing vegetation, creation of Fanno Creek riparian buffers, provision of stormwater infiltration/ treatment facilities, reduction of effective impervious surfacing, and design of ecological landscaping. GreenWorks designed a planting plan for this facility to provide an attractive, low maintenance setting, and to create a pocket park for neighborhood enjoyment in a redeveloping area of Milwaukie. The plan also included hardscape layout / entry courtyard and overall landscape treatment. GreenWorks prepared concept plans for public review and construction drawings for planting and irrigation improvements. GreenWorks developed design review presentation drawings and construction documents for this 200 unit housing project located in the heart of Portland’s South Auditorium District, overlooking Lovejoy Fountain. Key design issues included preservation of nine large existing elms in the adjacent plaza, blending the new building in with the Second and Third Avenue Pedestrian Malls, and the need for a large portion of project landscaping to be contained in raised planters over structured parking. We were responsible for design of hardscapes (including planters, pavings, and trellises), planting and irrigation. We also designed a large cascading fountain at the entry. GreenWorks received the National Concrete Masonry Association / ASLA National Award of Excellence, 1999 for their accomplishments at Village at Lovejoy Fountain. GreenWorks designed and supervised the construction of a new fountain as the finishing touch to a street level plaza for the City of Independence. The newly constructed street level plaza was part of a Public Amphitheatre project, which was also designed by GreenWorks. The fountain serves as the public face of the Amphitheatre and as an integral part of the streetscape. It provides a focal point for the street level plaza and announces one’s arrival to the City of Independence. The fountain design includes a custom cast bronze bowl on a pre-cast concrete pedestal within a set of tiered concentric basins faced with brick. Water flows from a single jet in the bronze bowl overflowing into the basins that are linked by spillways. The lower basin incorporates a stainless steel sign inscribed with the words “City of Independence”. The tops of each basin wall incorporate a pre-cast concrete cap that serves as seating and allows the Citizens of Independence to sit and feel the water. GreenWorks provided conceptual design, construction documents, and construction observation for this prominently located amphitheater in downtown Independence, Oregon. GreenWorks also provided cost estimates, stakeholder presentations, and constructability reviews. Project goals included the use of local or recycled materials where possible, preservation of existing vegetation, reduced water consumption, the use native plants, control of erosion, and reduced stormwater runoff. The amphitheater has become a major public gathering place for events all across the Willamette Valley. This facility is at the western edge of the civic / commercial core of downtown Tualatin. West of the project site is Hedges Creek Marsh and Sweek Pond, some of Tualatin’s most valuable and visible urban natural resources. GreenWorks’ landscape design embraces both the civic nature of the project and the project’s sensitive location adjacent to the marsh. GreenWorks’ design focuses on creating pedestrian-friendly entrances and courtyards, clear definable automobile entrances, innovative stormwater runoff management technique for the parking lots, and landscape management strategies incorporating ornamental to natural landscape types. GreenWorks provided landscape architectural design services for Chown Pella, located in the heart of Portland’s historic Pearl District. The landscape features for this 75 loft housing condominium and retail space development consisted of fencing, parking, street tree plantings and seating areas. The Madrona Lofts in the Rose Quarter of Portland offered a tremendous opportunity to rehabilitate a decaying hotel into much needed inner city, low-income housing complex. GreenWorks was part of a team of designers that analyzed the existing facilities and surrounding development for opportunities to improve both the project site and the pedestrian connections from the community, through the site, to the adjacent Rose Garden. Applying a number of sustainable site design practices, GreenWorks provided designs focused on developing meaningful pedestrian spaces and strengthening pedestrian connections to the surrounding developments.